Tinder has made a name for itself as a dating app with a notorious underbelly of whimsical hookups. No longer will that be its sole purpose! Since April, a group messaging and meetup feature has been in place for a number of Australian users. 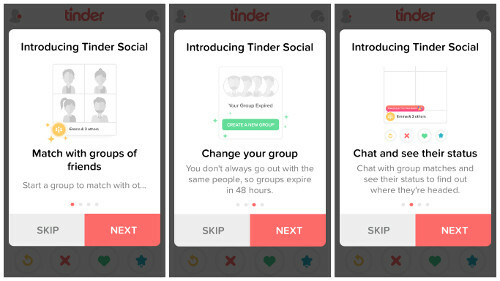 Called Tinder Social, the messaging feature was released on July 21st in the U.K., U.S., Canada, India and New Zealand. The current version of the app has Social built in, but you will need to initiate an update before it displays. Social requires activation before use. Once activated, users will be able to see which of their Facebook friends have opted in as well (this caused some concerns with users who didn't want their Tinder life made public). From there, the winning function is group creation. Limited to four members, groups are able to chat amongst themselves and broadcast their plans in a joint status that's visible to others. Four does seem a bit ... small though, doesn't it? Well, that's where Social has gotten inventive. Groups can choose to connect with other groups within a conjoined group message. That's a commitment right there; a large message group with people you may not be as tight with as your core group. Tinder's thought of that, too. By noon the next day (going by the group creator's timezone), groupsl expire, so don't stress if their group turned out to be a bunch of weirdos. Group leaders can also close groups and members can leave at any time they wish. The possibilities opened up by Social's group function are endless. Go out with a few friends early on in the night and broadcast your group plans on Social. The rest of your posse can join your group message to figure out a meetup spot or keep updated on your plans via your group broadcasts. If none of your IRL friends are free and you want to do a specific activity, just put out the idea and Social will match you with other internet friends who are interested. Tinder CEO and co-founder Sean Rad says, "Tinder Social is designed to make it as easy as possible to plan your night, get out into the real world and meet new people. 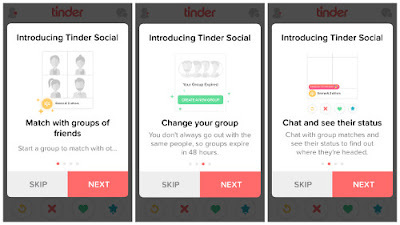 The new feature takes the Tinder experience to a new level, offering our users more ways to expand their social circles and interact with potential matches." 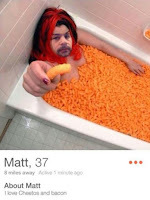 With this new tool, Tinder attempts to pull itself out of the dregs of the dating underworld. It'll have to battle with the likes of Google's WhatsApp and Facebook Messenger to do so though; and if you engage in fisticuffs with Google and Facebook, you're going to have a bad time. 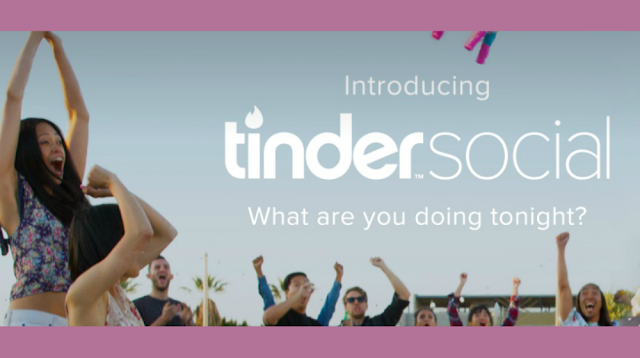 Historically, Tinder has been the kind of app that people won't admit to readily using. However, with its new utility, Tinder offers something that Google and Facebook can't: new friends at a swipe. Groups that were totally unconnected before can check local venues to see if any other interesting-looking groups will be there. Simply swipe to find groups and match up with potential friends, lovers, any sort of categorical name you want to file them under. The meetups, rather than being one-on-one dating scenarios, can instead be a much more easy-going friends hangout. 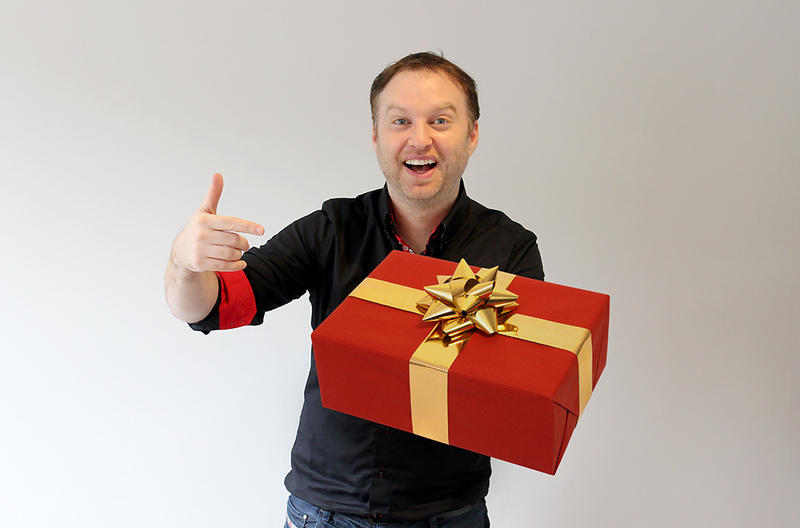 Since Social requires activation, it's only natural that it can be toggled on and off. Your dating profile, however, is a permanent fixture. Maybe do a quick edit before you try to make new friends on Social.